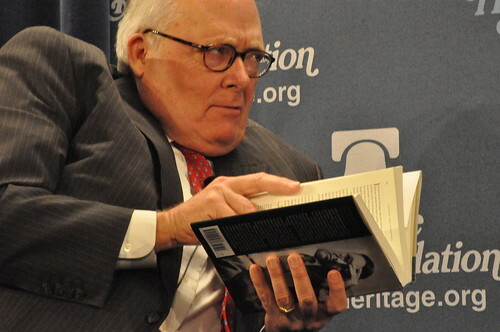 Heritage Foundation President Edwin Feulner. The Affordable Care Act–all 906 pages! The bill that inspired the “Read the Bill!” chant! The covers have been cracked, the pages have been turned and sections have been underlined! Just like you would if you had time. The King James Bible with the New Testament and the actual words of Jesus in red. All marked as if read! Act today. Our pre-readers and independent contractors from around the world are standing by to read and distress your books! Coming soon, our Pre-Eaten Food Program™ We eat it so you don’t have to! Comes with a complete set Ginzo knives! But wait there’s more! Also launching in April, the charity donation program that fulfills our 501 c 3 non-profit status making your subscription tax-deductible for income, gift, and estate taxes. Freedom Food™* especially for inner city men. *Heritage’s Freedom Food program consists of the results of the Pre-Eaten Food Program. It includes pre-digested food, Freedom to Read books and is part of this balanced budget. Not available in other first world countries. AUTHOR NOTE: The Freedom To Read, Pre-Eaten Food and Freedom Food Programs are all made up programs that parody the intellectual laziness and moral cruelty of many right wing foundations and programs. Any resemblances to actual right wing foundations and right wing leaders’s comments and ideas are purely intentional. Pre-April Fool.